I absolutely love risotto! The creaminess, the endless possibilities of flavors and the simple comfort of a bowl of risotto. This Lemon Leek Risotto is so good. Simple ingredients, a little patience and big flavor. I think you’ll be surprised at how easy it actually is to make this dish. So what makes risotto so fantastic? For me its such a comforting Italian dish. This dish cooks slowly allowing the starches in the arborio rice to develop that creaminess that makes risotto so incredible. For this one I wanted to go with some brighter flavor for the warmer weather so the addition of lemon zest. The sweetness of the leeks as they slowly cook, adds such amazing flavor to this dish too! And of course finished off with plenty of freshly grated parmigiano cheese. I’ve shared a couple fantastic risotto dishes here, like my Mushroom Risotto and Lemon Asparagus Risotto– you should definitely check them out. This one starts as all my risottos start… sautéing the veggie in some butter and olive oil as well as a simple sprinkle of salty and pepper. 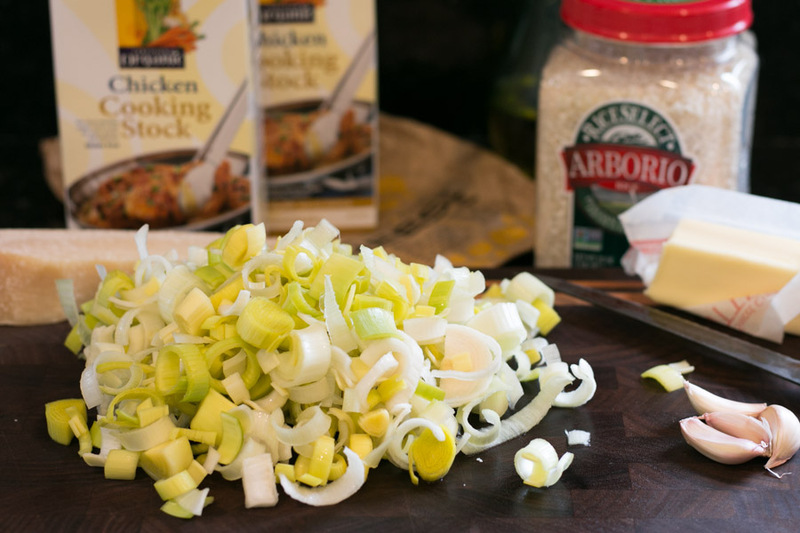 For this Lemon Leek Risotto I start with garlic and leeks. 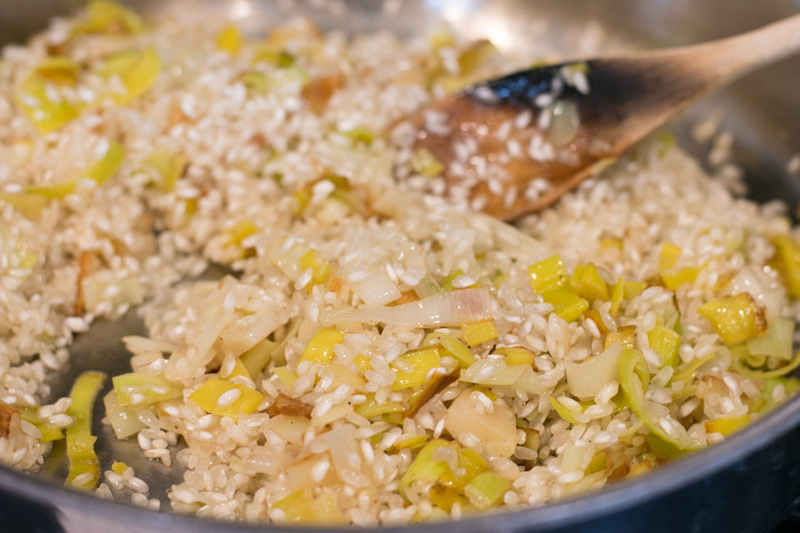 Once the veg is softened I add in the arborio rice, stirring, cooking until partially translucent. You can see in the grains or rice that the center is white while the outside is see through. Next goes in some white wine which is optional. Once the wine reduces you begin slowly stirring in warmed broth a ladle full at a time. After the broth is absorbed you continue to add in a ladle at a time. Thats it- patience and stirring while it slowly cooks absorbing all that goodness and the flavors develop. I did use chicken broth in my dish simply because I prefer the flavor but to keep it vegetarian simple use vegetable broth. To add another layer of creaminess- once you are done adding all the broth you remove the pan from the heat and add in a good bit of freshly grated parmigiano cheese and the zest from 1-2 lemons. The lemon zest adds amazing lemon flavor without any sourness. 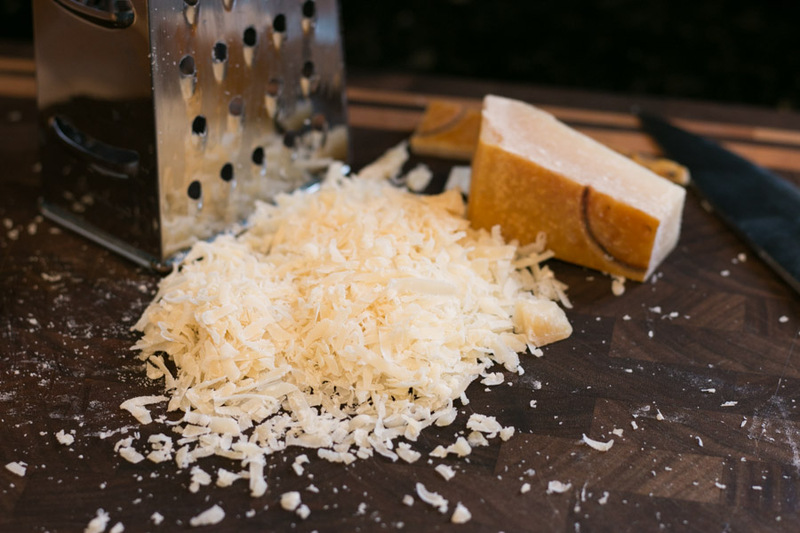 The parmigiano is the perfect bite of salty cheesiness! I did want to add one more element that again can be left out to keep it vegetarian- I chopped up and browned prosciutto to crumble over top before serving. 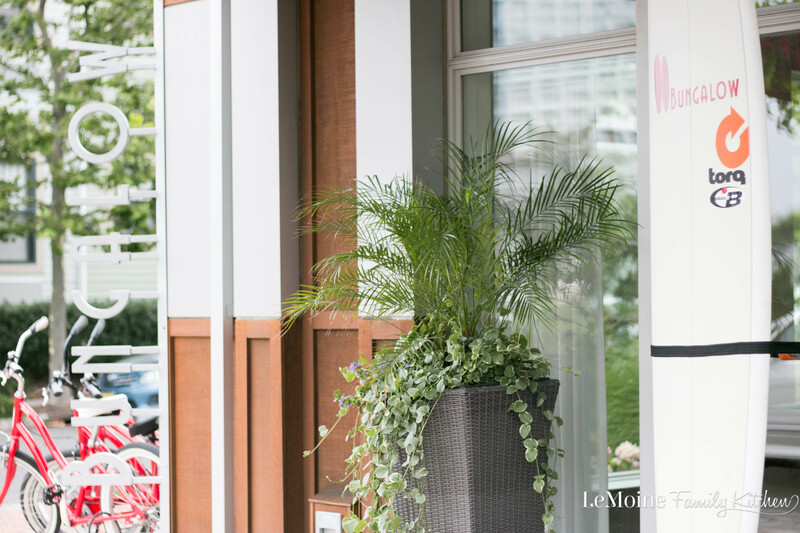 Elegant, full of amazing flavors and pretty darn easy right? Served on its own is an incredible meal but you can certainly enjoy this as a side to some grilled chicken or shrimp too! 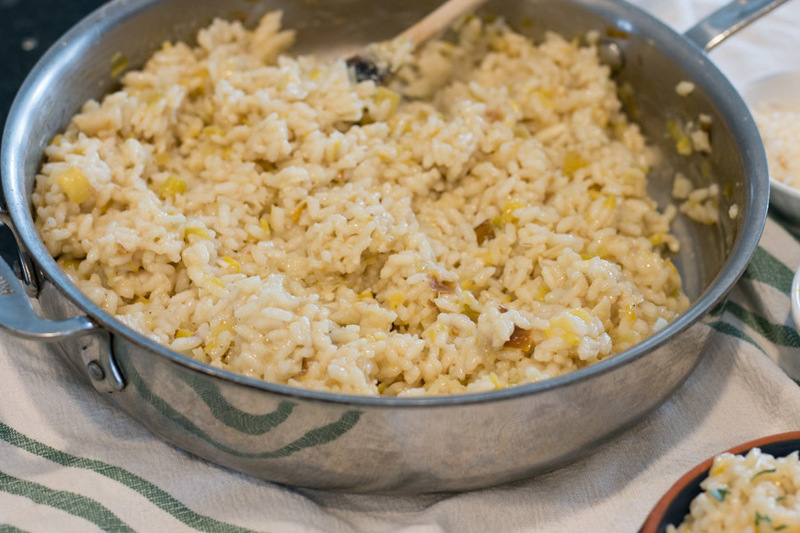 Either way- this Lemon Leek Risotto is a comforting and fabulous dish! In a large skillet, over medium heat, add in the olive oil, butter, garlic and leeks. Cook until softened. Stir in the arborio rice and cook, stirring frequently, until mostly translucent. Season lightly with salt and pepper. Add in the white wine and reduce by half. Add in 1 ladle at a time, the broth and stir as it absorbs. After each ladle full is absorbed add another until all the broth is absorbed and the rice is tender. Remove from the heat and stir in about ¾ cup of the grated cheese and the lemon zest. Season with salt and pepper to taste. Serve risotto with a garnish of freshly chopped parsley. and optional prosciutto crumbles. I too love risotto, and this looks fabulous. 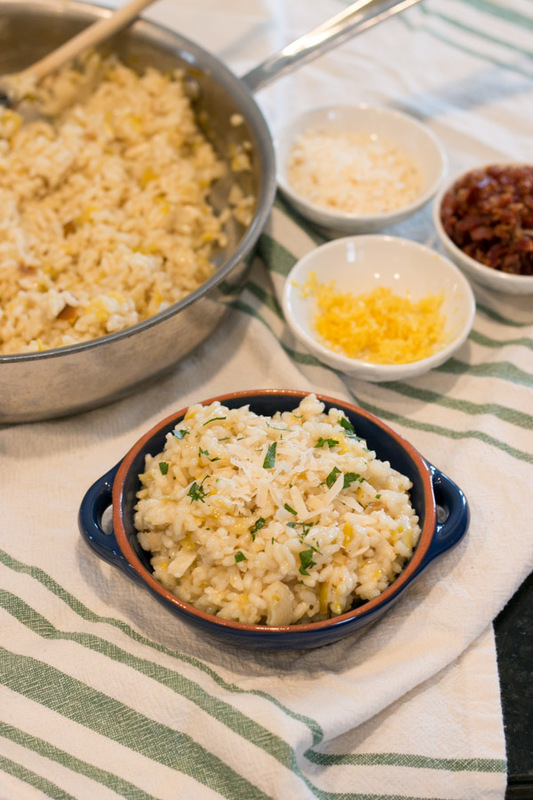 Nice combination of flavors in this rice dish! Risotto is one of my favorite foods, it’s worth every minute of stirring! I love the combination of flavors going on here and I can’t wait to try it! I agree!! We love it and honestly besides a little time and patience, its an easy meal. I love risotto!! 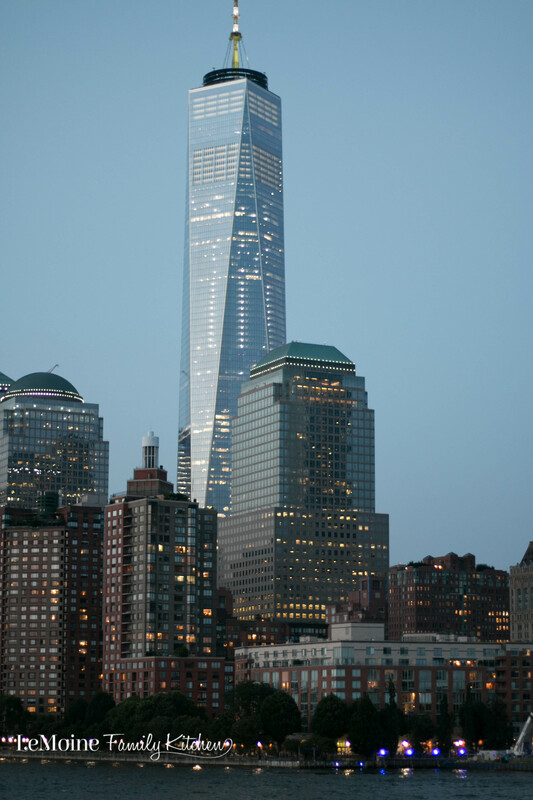 This one looks fabulous!! Leons and Leeks?? Oh my!! Thank you so much! This risotto turned out really great. The lemons and leeks certainly work wonderfully! This risotto looks amazing!! I love lemon flavored anything and you have leeks with it?? YUM! Thank you! Yes, the combo works really great! I hope you can give it a try soon. 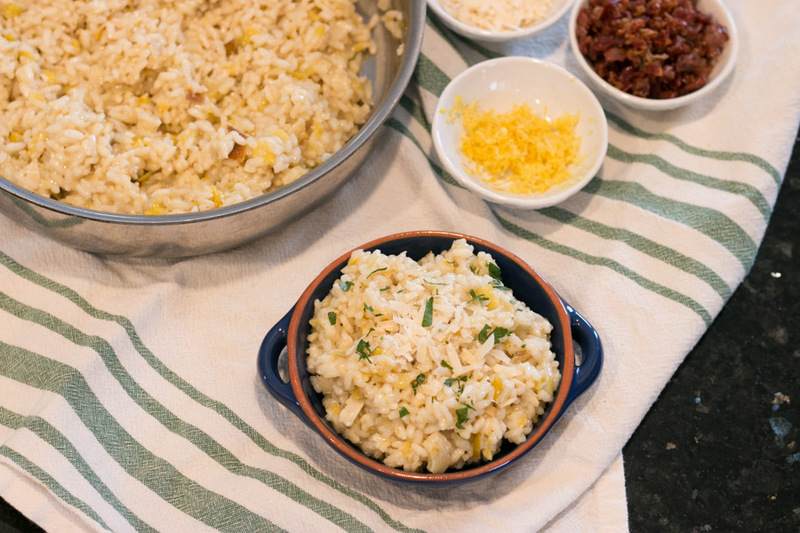 We consume so much rice in our home and recipes like these always go on our weekly meal plan. Those lemons and leek together were the perfect combination. Rice is so versatile isn’t it!? 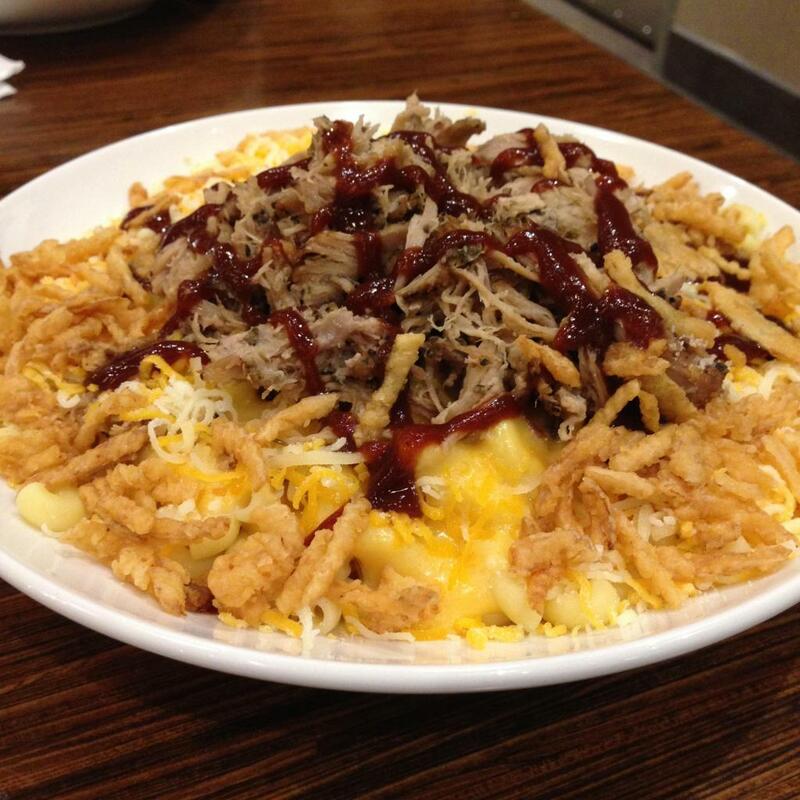 This dish is definitely a really tasty one! This sounds incredible, I love the combination of flavors! 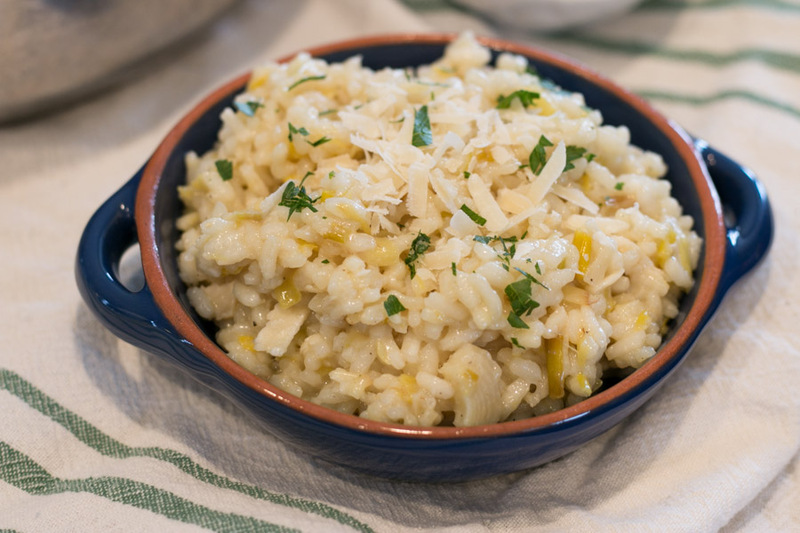 I love risotto and this lemon-lee version sounds just perfect for summer. Great job!! Thank you so much! Its a great dish. I love the texture of risotto and how it takes on the flavor from the ingredients you add, Lemon with leaks is a great flavor enhancer. Great recipe! Risotto is one of my favorite dishes. The lemon and leeks are a perfect addition. A great recipe for sure! Totally worth all of the stirring!! Love this. I totally agree! The flavors are fantastic! Risotto is one of my very favorite meals, so comforting! I used to make it every Sunday night. That’s a habit I need to get back into! Thank you for a lovely recipe!